Those words, found on the main page for EAT-Lancet, are from comments by Tarmara Lucas and Richard Horton, editors for The Lancet. EAT-Lancet is a campaign to force a high-carb, plant-based diet on all or most of the world’s population. The report itself, Food in the Anthropocene, is basically an opinion piece with the names of 37 scientists attached to it; but it doesn’t represent consensus opinion in the field nor are the references in the report reliable. The groups behind it have global aspirations. I don’t automatically have a problem with this, despite my dislike of technocratic paternalism, for I understand there are global problems that require global solutions (pollution, for example, knows no national boundary with 40% of worldwide deaths attributed to air pollution alone). But there is a long history of bad dietary advice being imposed on large populations. I’m not fond of dominator culture, no matter how good the intentions. We might be wise to take caution before going down that road again. Besides, there seems to be an inherent contradiction behind this advocacy. The report and the editorial both are praising basically what is the same old high-carb diet that governments around the world have been pushing since the late 1970s, a diet that is correlated with an epidemic of chronic diseases. The journal’s own editors seemingly admit that they see it as a forced choice between “a healthy diet” and “balancing planetary resources” — one or the other but not both. Or rather, since many of them don’t follow their own advice (more on that further down), it’s good health for the rich shoved onto the malnourished shoulders of the poor. This interpretation is indicated by how the report simultaneously acknowledges certain foods are healthy even as those very foods are supposed to be restricted. Then the authors suggest that vitamin supplementation or fortification might be necessary to make up for what is lacking. 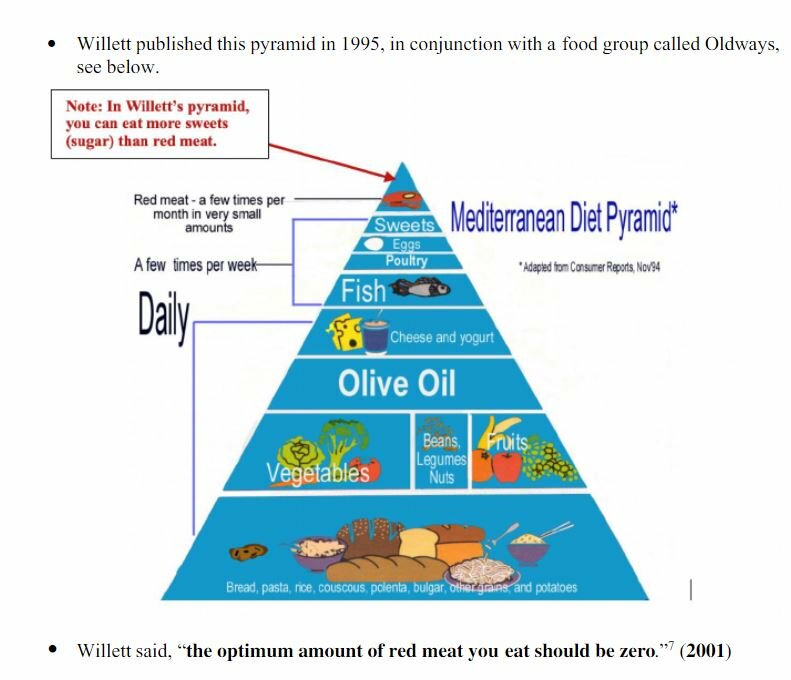 This is further supported by the words of Walter Willet, one of EAT-Lancet’s main advocates — he argues that, “If we were just minimising greenhouse gases we’d say everyone be vegan”, a highly questionable claim as the data is off, but Willett has also been reported as acknowledging that, “a vegan diet wasn’t necessarily the healthiest option”. The EAT-Lancet report itself actually discusses the health benefits of animal foods. Such a deficient diet can’t honestly be called healthy when it requires nutritional supplementation because the food eaten doesn’t fully nourish the body. Sure, if you want to be a vegan for moral reasons to save the planet or whatever, more power to you and be sure to take vitamins and hope you don’t become to malnourished and sickly. But let’s be clear that this has nothing to do with good health. Other than the ethics of meat-eating, why is this dietary regimen near-vegan in its restriction of animal foods? It’s not always clear, in the report, when a dietary suggestion is intended to promote human health or intended to promote planetary health (or maybe something else entirely). Are they really trying to save the world or simply hoping to prop up a collapsing global order? And what does this mean in practice? 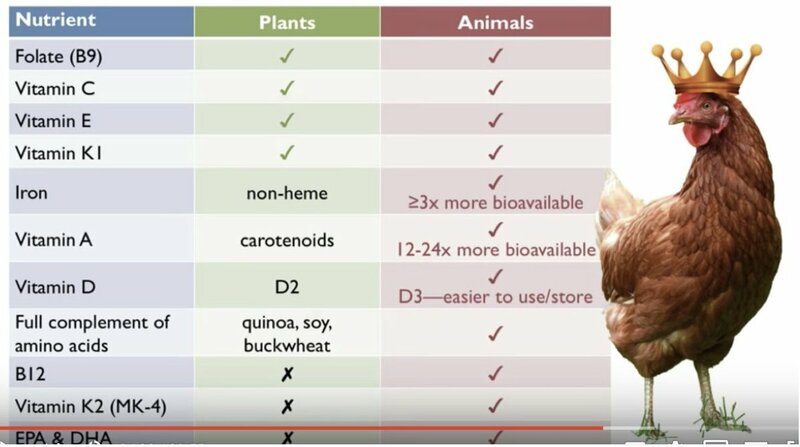 “Here is another question,” tweeted Troy Stapleton, “If one were to provide a patient with advice to eat a “plant based diet” should the patient also be given information that this advice is based on environmental concerns and not their health?” This is a serious set of questions when it comes to sustainability. This EAT-Lancet diet of high-carbs and processed foods is guaranteed to worsen the chronic diseases that are plaguing us, as Walter Willet has argued himself (see below), and the rapidly rising costs of healthcare because of this could bankrupt our society. That is the opposite of sustainable, even if one ignores the moral quandary of giving people bad health advice in the hope that it might save the planet, despite the lack of evidence supporting this hope. I have no doubt the EAT-Lancet proponents know this kind of data. But since among the authors of the report “more than 80% of them (31 out of 37) espoused vegetarian views” and “have, through their work, been promoting vegetarian, anti-meat views since before joining the EAT-Lancet Commission” (Nina Teicholz) and since “Oxford’s Dr Marco Springmann, the scientist behind much of the environmental portion of EAT Lancet[,…] is an activist vegan not considered biased but a cattle rancher is” (Frank Mitloehner), they wouldn’t be biased toward spreading this contrary evidence that undermines their belief system and ideological agenda. As these same scientists know or should know, this is not a new situation since malnourishment caused by dietary guidelines has been going on for generations at this point (consumption of nutrient-dense foods and animal-based foods has followed the same downward trend, opposite to the upward trend of simple carbs, seed oils, and processed foods). This point is also made by Teicholz: “Americans have eaten more plants, fewer animal foods, and 34% less red meat since 1970. While, rates of obesity and diabetes have skyrocketed. How does it make sense that continuing on this path will improve health if it hasn’t so far?” Compare that to American in “1955 when more than half of our calories came from meat, eggs, milk, cream, fats and oils […] and adult diabetes was virtually unheard of“ (Adele Hite, Keeping it Simply Stupid) and that was a lower level of animal foods than seen before that, such that: “In 1900 our diet was 10% carbs, in 2010 it is 63%” (Carroll Hoagland). This isn’t limited to Americans since the 1977 US Department Diet Guidelines were adopted widely throughout the world, based on extremely weak evidence and bad science. Official dietary recommendations have been a grand failure, one could easily argue, and we have no reason to expect different results, other than a continued worsening as ill health accumulates from one generation to the next. Then again, maybe it hasn’t failed in that maybe it’s purpose was never to promote public health in the first place. When something seems to fail and continues to get repeated, consider the possibility that it is serving some other purpose all too well. If so, the real agenda simply isn’t the one being publicly stated. Not to be conspiratorial, but human nature is what it is and that means people are good at rationalizing to themselves and others. It is largely irrelevant whether or not they sincerely believe they have good intentions. The commissioners of the report recommend that governments use “choice editing” in order to “guide choice” (nudge theory) through incentives, disincentives, and default policy or, failing that, “restrict choice” and “eliminate choice” to enforce compliance. That is to say, “the scale of change to the food system is unlikely to be successful if left to the individual or whim of consumer choice. This change requires reframing at the population and systemic level. By contrast, hard policy interventions include laws fiscal measures, subsidies and penalties, trade reconfiguration, and other economic and structural measures.” And they are ambitious: “For significant transformation to happen, all levels of society must be engaged, from individual consumers to policymakers and everybody along the food supply chain.” This interventionism, including “banning and pariah status of key products” along with “rationing on a population scale”, would be more authoritarian in its proposed strategy than prior guidelines. I wish that were a joke, but they are deadly serious. With a straight face, the same corporate-funded interests (big food, big ag & big oil) behind EAT-Lancet are telling us that, “We support the implementation of a global treaty to limit the political influence of Big Food” (Kat Lay, Tackling obesity ‘needs treaty like climate change’). “If hypocrisy was a food group we could feed thousands and thousands of people” (Linda Snell). It’s misleading to call these ‘guidelines’ at all when the object is to eliminate choice because the masses are seen as being too stupid and weak to make the right choice. No doubt, an austerity diet would never be willingly accepted by entire populations. In the blockade following World War II, the residents of Berlin were forced by circumstances into severe restriction of a subsistence diet based mostly on carbs while low in calories, protein and fat — not that far off from the present official dietary ideology. Writing in 1952, Dr. H. E. Magee, Senior Medical Officer of the UK Ministry of Health, concluded: “The Berlin diet was austere… and only the compelling force of hunger and the fear of political oppression would, I believe, make any civilized community continue to eat a similar diet for as long as the Berliners did” (Nutrition Lessons of the Berlin Blockade). Yet so many officials continue with the mentality that austerity diets are the way to go: calorie counting, portion control, etc. But Gary Taubes, In Why We Get Fat, shows that all this accomplishes is making people endlessly hungry with the perverse effect of gaining weight, even if initially losing it. Other than a blockade or government enforcement, hunger almost always wins out. That is why the only successful diets are satiating, which generally means nutrient-dense and high-fat. But to the modern mind built on Christian morality, the real problem is that we are gluttonous sinners. We must be punished with deprivation to cleanse our souls and expiate our sins. As always, the elite want to tell the lower classes how to live and then to have them do as their told, by carrot or stick. “The EAT-Lancet Commission spent three years calculating the first scientific targets for a healthy, globally-sustainable diet,” wrote Nick McDermott. “But,” he noted, “the panel of experts admitted none of them were on it.” Most of them admit their hypocrisy and the others maybe are unwilling to state it publicly: “The commission said red meat should be seen as “a treat”, similar to lobster but the plan is so strict that two out of three commission members introducing the diet at a briefing in London on Wednesday said they were not currently sticking to it. Dr Richard Horton, Editor-in-Chief at The Lancet, said: “I’m close, but I have two eggs for breakfast every morning, so I’m already having too many eggs.” Author Dr Line Gordon, director of the Stockholm Resilience Centre, also admitted: “I am moving towards it, but I have young kids at home, which is driving me in the wrong direction” (Sarah Knapton, ‘Planetary health diet’: Britons urged to cut meat intake to equivalent of one beefburger a fortnight). I was reminded of the exact same thing. In reference to Ancel Key’s “stringent vows of the dietary priesthood”, Sally Fallon Morell offers the following note (p. 157, Nourishing Diets): “Actually, Keys recommended the practice of renunciation for the general population but not for himself or those of his inner circle. The esteemed researcher Fred Kummerow, PhD, defender of eggs and butter in the human diet, once spied Keys and a colleague eating eggs and bacon at a conference for cardiologists. When Kummerow inquired whether Keys had changed his mind about dietary fats and cholesterol, Keys replied that such a restricted diet was “for others,” not for himself.” In The Big Fat Surprise, Nina Teicholz also talks about this hypocrisy: “Keys himself, according to the [Times Magazine (January 13, 1961)] article, seemed barely to follow his own advice; his “ritual” of dinner by candlelight and “soft Brahms” at home with Margaret included meat—steak, chops, and roasts—three times a week or less. (He and Stamler were also once spotted by a colleague at a conference tucking into scrambled eggs and “five or so rations” of bacon.) “Nobody wants to live on mush,” Keys explained” (p. 62). Keep in mind that Keys was the main figure that forced this dietary religion onto the American population and much of the rest of the world. With persuasive charisma, he righteously advocated that others should eat a high carb and fiber diet with restricted animal products: meat, fat, butter, eggs, etc. This became government policy and transformed the entire food sector. The eventual impact has been on possibly billions of people over multiple generations. Yet it wasn’t important enough for his own dietary habits. There is not enough to go around, but don’t worry, our benevolent overlords will never go without. As yet another put it with some historical context, “The elites will never eat this diet they prescribe to the masses. Meat for me. And wheat for thee. The elites with their superior bodies brains intellects and money will need special nutrition to maintain their hegemony and rightful place as leaders of the planet. Ask yourself why the silicon valley brainiacs are all on keto/carnivore. It’s a reenactment of feudal life w fatty meats for the elites & thin gruel for the peasants” (David Smith). A high-carb diet combined with low-protein and low-fat has always been a poverty diet, rarely eaten by choice other than by ascetic monks: “A vegetarian or fish-based diet was most often associated with self-denial and penitence” (Sydney Watts, “Enlightened Fasting”; from Food and Faith in Christian Culture, p. 119). Worse still, it easily can lead to malnutrition and, except when calories are pushed so low as to be a starvation diet, it’s fattening. This general strategy has been done before. It’s a way of shifting the blame and the consequences elsewhere. It’s the same as promoting feel good policies such as encouraging recycling for households, which helps distract from the fact that the immensity of waste comes from factories and other businesses. The rich use most of the resources and cause the most problems. Yet it’s the rest of us who are supposed to take responsibility, as consumer-citizens. What the rich pushing this agenda refuse to talk about is that the entire system is to blame, the very system they benefit the most from. The only way to solve the problem is to eliminate the socioeconomic order that creates people so rich and powerful that they dream of controlling the world. If sustainability is the genuine concern, we need to return to a smaller-scale decentralized way of living where solutions come from communities, not enforced by distant bureaucrats and technocrats. But that would mean reducing inequality of wealth and power by bringing the resources and decision-making back to local populations. As Peter Kalmus wisely put it, “You cannot have billionaires and a livable Earth. The two cannot go together.” That isn’t what the billionaires Petter and Gunhild Stordalen leading this campaign want, though (their organization is the EAT part of EAT-Lancet). They like the inequality just fine the way it is, if not for the problem of all those poor people. As Herman Melvile put it, “Of all the preposterous assumptions of humanity over humanity, nothing exceeds most of the criticisms made on the habits of the poor by the well-housed, well-warmed, and well-fed.” The rich are worrying about what will happen when the living conditions, including diets, improve for the rest of the global population. And there is reason to worry for, after all, it is a finite planet. But the upper classes should worry about themselves, with the externalized costs of their lifestyle (on a finite planet, externalizations that go around come around). Once the obstructionist elite get out of the way, I have no doubt that the rest of us can come up with innovative responses to these dire times. Locally-sourced food eaten in season, organic and GMO-free agriculture, community gardens and family farms, crop rotation and cattle pasturage, farmers markets and food co-ops, etc — these are the kinds of things that will save the world, assuming we aren’t already too late. A local diet including animal foods will be a thousand times better for the planetary biosphere than turning all of earth’s available land into big ag industrial farming in order to support a plant-based diet. Even in the EAT-Lancet report, they agree that “animal production can also be essential for supporting livelihoods, grassland ecosystem services, poverty alleviation, and benefits of nutritional status.” They even go so far as to add that this is true “particularly in children and vulnerable populations.” Wondering about this dilemma, Barry Pearson states it bluntly: “Eliminating all people who EAT-Lancet isn’t suitable for, who is left? So far list of people it isn’t suitable for appears to include: Children. Old people. Pregnant or potentially pregnant women. People with diabetes. Has anyone identified a list of who it IS suitable for?” And Georgia Ede makes the same point, adding some to the list: “Yet the authors themselves admit diets low in animal foods are unhealthy for babies, growing children, teenage girls, pregnant women, aging adults, the malnourished, and the poor, and that high-carbohydrate diets are risky for those w/ insulin resistance.” Yet the EAT-Lancet true believers largely dismiss all animal foods, which are the best sources of fat-soluble vitamins that Weston A. Price found were central to the healthiest populations. Somehow too much animal products are bad for you and the entire planet, not just red meat but also chicken, fish, eggs and dairy (anyway, why pick on red meat considering over the past century beef consumption has not risen in countries like the United States or in the world as a whole). Instead, we’re supposed to sustain ourselves on loads of carbs, as part of the decades of government-subsidized, chemically-doused, genetically-modified, and nutrient-depleted “Green Revolution”. 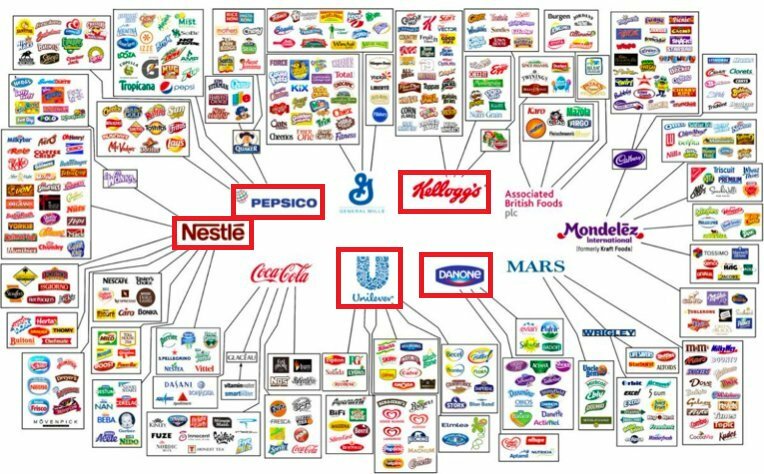 That should make happy the CEOs and shareholders of big ag, some of the main corporate backers of EAT-Lancet’s global agenda. “Ultra-processed food manufacturers must scarcely believe their luck. They’ve been handed a massive rebranding opportunity free of charge, courtesy of the vegan desire for plant-based junk posing as dairy, meat, fish, and eggs” (Joanna Blythman). What they don’t explain is how the world’s poor are supposed to eat this way. That is no minor detail being overlooked. Most of the population in the world and in many developed countries, including the United States, are poor. This idealized diet is presented as emphasizing fruits and vegetables. But in many poor countries, fruits and vegetables are more expensive than some animal foods. That is when they are available at all which is often not the case in the food deserts that so many of the poor are trapped in. The authors of the report do admit that animal foods might be increased slightly for many demographics — as Dr. Georgia Ede put it: “Although their diet plan is intended for all “generally healthy individuals aged two years and older,” the authors admit it falls short of providing proper nutrition for growing children, adolescent girls, pregnant women, aging adults, the malnourished, and the impoverished—and that even those not within these special categories will need to take supplements to meet their basic requirements.” It’s not clear what this means, as this admission goes against their general recommendations. The proposal is vague on details with neither food lists nor meal plans. And, oddly, the details shown don’t actually indicate greater amounts of fruits and vegetables, as the plant-based foods mostly consist of carbs (according to Optimising Nutrition’s Should you EAT Lancet?, the calorie breakdown should be: 70% plant-based including sweeteners; with 46% carbs; only 3% vegetables & 5% fruits; & a remarkable 5% for sweeteners, about equal to allowance of meat). The report, though, isn’t entirely worthless for it does correctly point out some of the problems we face, specifically as part of a global crisis. But it most definitely is confusing and internally conflicted. Even if it genuinely were a diet high in healthy produce, it’s not clear why the dismissal of all animal foods, including eggs and dairy that are enjoyed by most vegetarians and non-vegetarians alike. If feeding the world is the issue, it’s hard to beat an egg for cost effectiveness and it accomplishes this without need for the kind of subsidization we see with high-yield crops. When I was poor, I survived on eggs with the expensive ingredient being the few frozen vegetables I threw in for balance and variety. Eggs are filling, both satisfying and satiating. Also, they make for a quick and easy meal, an advantage for the working poor with limited time and energy. We are being told, though, that eggs are part of what is destroying the world and so must be severely limited, if not entirely eliminated, for the good of humanity. “While eggs are no longer thought to increase risk of heart disease, Willett said the report recommends limiting them because studies indicate a breakfast of whole grains, nuts and fruit would be healthier” (Candice Choi). So, there is nothing unhealthy about eggs, but since they are made of protein and fat, we should eat more carbs and sugar instead — “According to EAT Lancet, you can eat 8 tsp of sugar but only 1/4 egg per day” (Nina Teicholz). After all, everyone knows that American health has improved over the decades as more carbs and sugar were eaten… no, wait, it’s the complete opposite with worsening health. That is plain fucked up! Explain to me again why eggs, one of the cheapest and healthiest food sources, are being targeted as a danger to human existence in somehow contributing or linked to overpopulation, environmental destruction, and climate change. What exactly is the connection? Am I missing something? Whatever the explanation, eating less of such things as eggs, we are supposed to eat more of such things as vegetables, at least in taking at face value how this diet is being sold. Let’s pretend for a moment that the Eat-Lancet diet is accurately described as largely oriented toward fruits and vegetables and that, as a sweeping recommendation, this is fully justified. Consider that, as Diana Rodgers explains, “Fresh produce is not grown year round in all locations, not available to everyone, and by calorie, weight, and micronutrients, more expensive than meat. Oh, and lettuce has three times the GHG emissions of bacon and fruit has the largest water and energy footprint per calorie. I didn’t see this mentioned in the EAT Lancet report.” We forget that our cheap vegetables in the West are actually rather uncommon for much of the world, excluding root vegetables which are more widely available. I’d guess we only have such a broad variety of cheap vegetables here in the West because its part of the government-subsidization of high-yield farming, which by the way has simultaneously depleted our soil and, as a consequence, produced nutrient-deficient food (also, there is the American Empire’s neoliberally-rationalized and militarily-protected “free trade” agreements that have ensured cheap produce from around the world, but this simultaneously makes these foods out of reach for the foreign populations that actually grow the produce). I’m all in favor of subsidizing vegetables and much else, but I’d rather see the subsidization of sustainable farming in general that promotes nutrient-dense foods, not limited to plants. Anyway, how is telling poor people to eat more expensive and, in some cases, problematic foods going to help the world’s population that is struggling with poverty and inequality? “And what are the things individuals can do to reduce their carbon footprint?,” as also brought up by Rodgers. 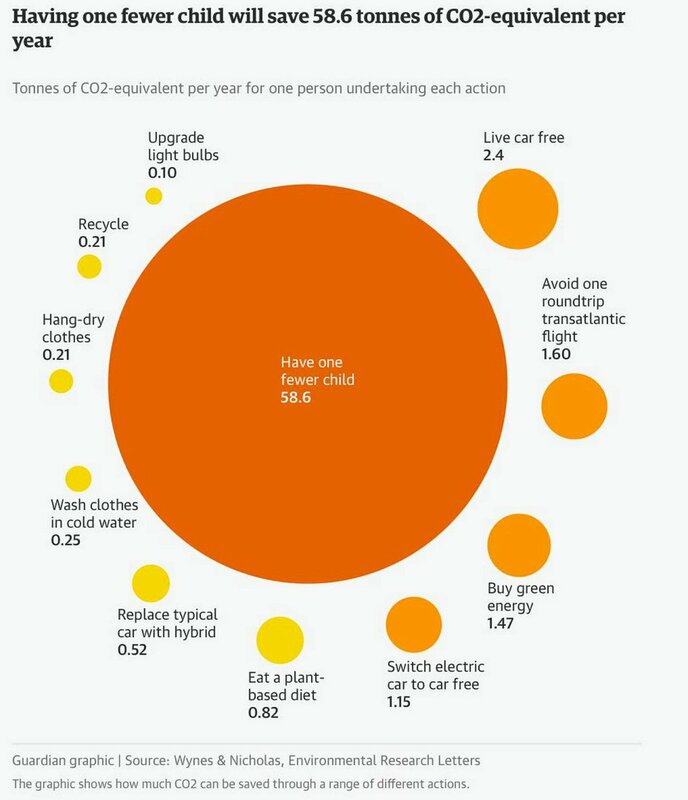 “According to a recent meta-analysis, having one less child (in industrialized nations), which was shown by far to have the biggest impact, followed by living “car-free”, avoiding one round-trip trans-Atlantic flight, and buying “green” energy have much more of an effect on our carbon footprint than our dietary choices.” Most people in the West are already having fewer children. And most people in the rest of the world already live without cars. We know that the birthrate goes down when life conditions are improved and this is already being observed, but this dietary regime would worsen life conditions through austerity politics and so would make people feel more desperate than they already are. As for transportation, many things could lessen the externalized costs of that, from funding public transportation to the relevant option of increasing local farming: “New research from the University of California also recently concluded that grasslands are an even better and more resilient carbon storage option than trees.” (Danielle Smith, If you care about the planet, eat more beef); “These multiple research efforts verify that practical organic agriculture, if practiced on the planet’s 3.5 billion tillable acres, could sequester nearly 40 percent of current CO2 emissions” (Tim J. LaSalle & Paul Hepperly, Regenerative Organic Farming); see also this Ted Talk by Allan Savory and this paper. 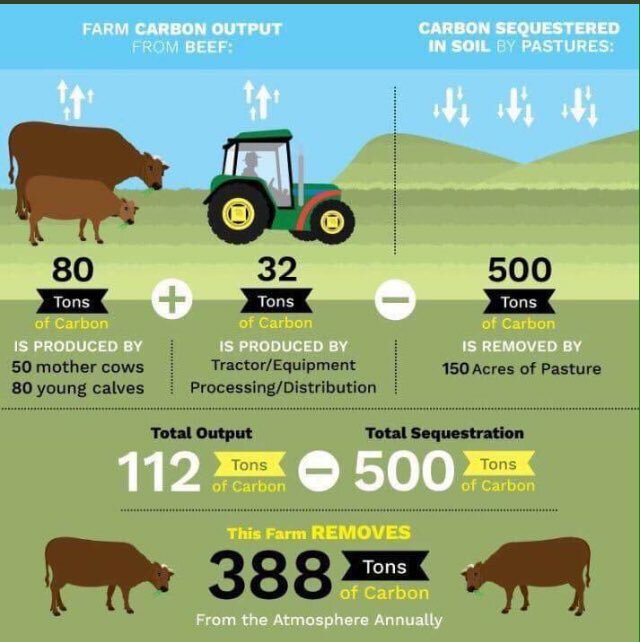 Cattle aren’t the problem, considering that the earth for hundreds of millions of years has supported large numbers of ruminants without pollution, erosion, or any other problems. The United States maintains fewer cows than there were buffalo in the past and furthermore: “Ruminant herds have been a feature of our ecosystem since before the fall of the dinosaurs. Yes, they produce methane (so do we), but the atmosphere is accustomed to that level of methane. I can’t find data on total global animal biomass trends, but as the population of humans and domesticated animals has increased, so populations of wild animals (and particularly megafauna) has decreased. What is concerning is releases of methane that has been sequestered from the atmosphere over thousands or millions of years – melting permafrost, drained peatbogs and swamp forests. Methane is a significant greenhouse gas. But to get back to where we started, methane is a natural component of the atmosphere; the carbon from farts comes from the food that is eaten and is recycled as new food that grows; there is no evidence that I’m aware of that the total volume of farting is increasing.” (Simon Brooke). An accurate and amusing assessment. 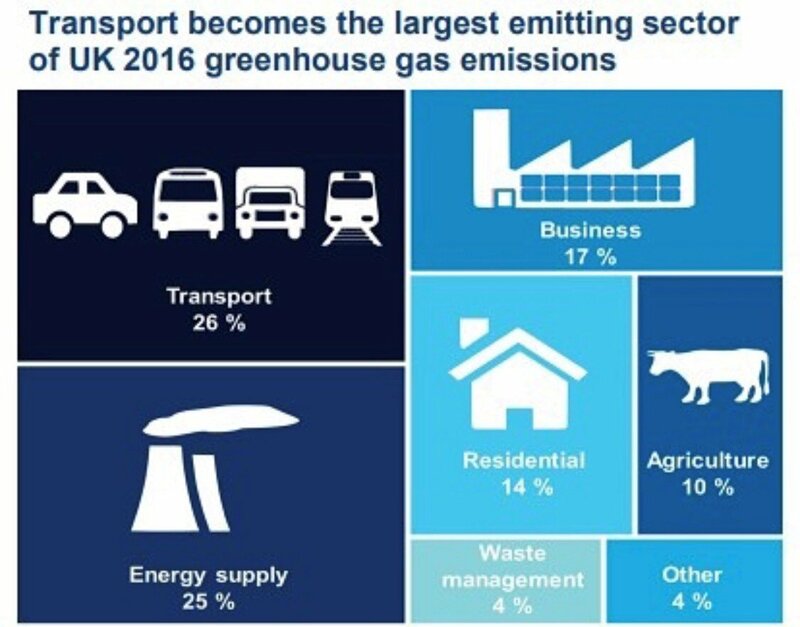 More mass industrial farming to support this top-down dietary scheme from EAT-Lancet would require more mass transportation and inevitably would create more pollution. One has to be insane to believe this is the solution or well-paid by self-serving interests to claim to believe it. One might note that EAT-Lancet is specifically partnered with big biz, including big ag companies such as Monsanto that has poisoned the world’s population with Roundup (i.e., glyphosate), and understand that big ag is among the most powerful interests in the US considering our country’s wealth was built on agriculture (a great example being the wealth of the plutocratic and corporatist Koch brothers whose wealth in part came from manufacturing fertilizer). Other companies involved are those developing meat alternatives produced from the industrially-farmed crops of big ag. And big ag is dependent on big oil for production of farm chemicals. EAT Foundation president and founder, Gunhild Stordalen, has been noted as a significant figure in the oil industry (Lars Taraldsen, ONS 2014 conference program to feature oil industry heavy hitters). But don’t worry about how this carb-laden diet of processed foods will harm your health with the majority of the American population already some combination of insulin sensitive, pre-diabetic, and diabetic — they’ve got this covered: “The drug company Novo Nordisk supports Eat-Lancet. Smart. Insulin is 85% of their revenue” (P. D. Mangan). I’m beginning to see a pattern here in the vested interests behind this proposal: “Eat lancet sponsors. Chemical companies, pharmaceutical companies (mostly making diabetes meds), the world’s biggest pasta manufacturer, the world biggest seed oil supplier, the world’s biggest breakfast cereal supplier” (David Wyant); “Pesticides, fertilisers, #gm (Bayer/Monsanto, BASF, Syngenta);sugar+fake flavourings/colourings (PepsiCo, Nestle, Givaudin, Symrise);ultraprocessed grains/starches (Cargill, Kellogg’s);#palmoil (Olam); additives and enzymes (DSM)- companies backing #EatLancet diet. I wonder why?” (Joanna Blythman). Just to throw out a crazy idea, maybe transnational corporations are the problem, not the answer. “Just think about it. EAT Lancet is the processed food industry telling us that eating more processed food is good for our health & planet. That’s like oil industry stating burn more fossil fuel will save planet. Vested interests think we are that gullible?”, in the words of Gary Fettke, an outspoken surgeon who (like John Yudkin and Tim Noakes) was bullied and harassed when challenging the powers that be, for the crime of advising an evidence-based low-carb/sugar diet. “This Poison Cartel of companies,” writes Vandana Shiva in reference to the corporate alliance behind EAT-Lancet, “have together contributed up to 50% Green house gases leading to climate change, and the chronic disease epidemic related to chemicals in food, loss in diversity in the diet, industrially processed junk food, and fake food.” The Lancet Journal itself, from a new report, is now warning of us the exact same thing, in that many corporate sectors (including those backing EAT-Lancet) receive $5 trillion in government subsidies: “Big Food’s obstructive power is further enhanced by governance arrangements that legitimize industry participation in public policy development” (Swinburn et al, The Global Syndemic of Obesity, Undernutrition, and Climate Change). The whole health and sustainability claim is a red herring. The EAT-Lancet commissioners and others of their ilk don’t feel they have to justify their position, not really. They throw out some halfhearted rationalizations, but they fall apart under casual scrutiny. Furthermore, there is far from being a consensus among the experts. The Associated Press offered some dissenting voices, such as “John Ioannidis, chair of disease prevention at Stanford University, said he welcomed the growing attention to how diets affect the environment, but that the report’s recommendations do not reflect the level of scientific uncertainties around nutrition and health.” Ioannidis, a non-partisan researcher in dietary debates, was quoted as saying, “The evidence is not as strong as it seems to be.” That is to put it mildly. We are in the middle of a replication crisis in numerous fields of science and, as Ioannidis has shown, food-related research is among the worse. When he says the evidence is not strong enough, people should pay attention. ““There are few exceptions, but the status of epidemiological literature is not at a level to allow us to make these types of very detailed, specific recommendations,” Ioannidis tells me. For that reason, the health claims in the EAT-Lancet diet are “science fiction. I can’t call it anything else”” (Sam Bloch, World Health Organization drops its high-profile endorsement of the EAT-Lancet diet). In 2010, Walter Willett is again quoted in The Los Angeles Times declaring this same message in no uncertain terms: “Fat is not the problem […] If Americans could eliminate sugary beverages, potatoes, white bread, pasta, white rice and sugary snacks, we would wipe out almost all the problems we have with weight and diabetes and other metabolic diseases” (Marni Jameson, A reversal on carbs). He has been defending this consistent message for a while now. Why this sudden turnabout in defense of carbs by blaming fats once again? Is he just following the money as a scientific mercenary for hire to the highest bidder? I’ll give them credit for bringing it up at all, however inadequately. They do admit that our food system has failed. That makes it all the more unfortunate that, in many ways, they are demanding more of the same. As others have noted, the diet they have fashioned for the world is severely lacking in nutrition. And they offer no convincing suggestions in how to reverse this problem. It won’t help to eat more plant-based foods, if they are grown through chemical-dependent high-yield farming that is depleting the soil of minerals and killing earthworms, microbes, etc: “Veganism is a huge misinterpretation of what a responsible diet might look like. It fully supports and exacerbates industrial farming of grains, pulses, fruits and vegetables through high inputs, maximising yields at all costs and depleting soils.” (Cassie Robinson). The idea of nutrient-dense foods as part of traditional farming and healthy soil is simply not on the radar of mainstream thought, especially not within our corporatist system. That is because a large portion of nutrient-dense foods don’t come from plants (especially not high-profit monoculture crops) and, furthermore, aren’t compliant with industrial agriculture and food production. That isn’t to say we should necessarily be eating massive amounts of meat, but animal foods have been the key element to every healthy population — in fact, compared to the United States, the top two longest-living countries in the world (Hong Kong and Japan) eat more animal foods by some acconting, including lots of red meat, although Americans are probably ahead of those two countries on dairy foods, which taken together is an argument for the paleo diet. Even among vegetarians, the healthiest are those with access to high quality dairy and eggs, along with those eating food from traditional farming that includes many insects and soil microbes mixed in with what is grown (the latter was shown in a study that vegetarians in a region of India were healthier than in another, and the difference was the unintentional insects in the diet from traditional farming). None of that, as far as I can tell, is discussed in the EAT-Lancet report. The authors offer no helpful advice, no long-term vision that can move us in a positive direction. Their ideology is getting ahead of the science. A sense of urgency is important. But impatience, especially the EAT Foundation’s self-described “impatient disruption”, won’t serve us well. It was careless hubris that got us here. It’s time we learn to respect the precautionary principle, to think carefully before collectively acting or rather before the ruling elite goes forward with yet another harebrained scheme. If as a society we want to direct our sense of urgency toward where it counts, that wouldn’t be hard to do: “World: Stop wasting a third of the food produced. Stop wrapping it in needless packaging. Stop transporting food half way round the world. Stop selling food at below-cost prices. Stop undercutting our produce with low standard alternatives. Then I’ll discuss how much meat I eat” (David Hill). It would mean drastically transforming our political and economic system. Capitalism and corporatism, as we know it, must end for the sake of humanity and the planet. As a member of the liberal class, Gunhild Stordalen (founder and president of EAT Foundation) knows how to say the right things. Listen to how she sets up this brilliant piece of rhetoric: “What we eat and how we produce it drives some of our greatest health and environmental challenges. On the other hand, getting it right on food is our greatest opportunity to improve the health of people and planet. This will require concerted action across disciplines and sectors – and business will be a key part of the solution.” Much of it sounds nice, too nice. But the only part of that statement that was honest was the last bit. All one should hear is “Blah, blah, blah… and business will be a key part of the solution.” And she isn’t referring to small family farms, mom-and-pop grocery stores, and local co-ops. This is a corporatist vision of concentrated wealth and power. These people are serious about remaking the world in their own image. As Anand Giridharadas put it in another context: “Elites, he wrote, have found myriad ways to “change things on the surface so that in practice nothing changes at all”. The people with the most to lose from genuine social change have placed themselves in charge of social change – often with the passive assent of those most in need of it.” No thanks! We don’t need a corporate-owned nanny state telling us what to do. If scientific and political institutions weren’t being manipulated, if the corporate media wasn’t used to propagandize and manage public perception, and if powerful interests weren’t spreading disinfo and division, it would be a lot easier for we the people to become an informed citizenry able to figure out how to democratically solve our own problems. We could even figure out how feed ourselves for health and sustainability. Despite it all, that is what we’re working toward. Human beings, especially as we age, cannot do without protein. The EAT-Lancet Commission’s recommendation to cut beef consumption to just a quarter ounce per day (7g) is a drastic departure from evidence showing meat and dairy improve diets. Stuart Phillips, Professor; Director, Physical Activity Centre of Excellence. McMaster University, Canada. The report’s recommendations do not reflect the level of scientific uncertainties around nutrition and health. The evidence is not as strong as it seems to be. The cornerstone of a healthy diet is still meat and dairy. Take those out and you’ll have under-nutrition and frailty. It’s unavoidable. The #EatLancet Commission work does not reflect consensus among scientists. We need to invest in research to inform dialogue on what is healthy and sustainable. We should not base recommendations based on assumptions and 40+ year old confounded cohorts. Scientists must stop making premature recommendations based on opinion and weak data like in the past (e.g., eggs and fat). Unintended consequences happen folks. Let’s not make the same mistake twice! As a cardiologist, I’ve made healthy lifestyle recommendations to thousands of patients, and it is clear that the best lifestyle is one people can actually maintain over the long term. It turns out that animal protein and fat are uniquely satiating — thus keeping hunger at bay — and therefore a friend to any dieter. It is lamentable that the EAT-Lancet authors should want to impose their ideas about healthy diets on all populations worldwide. You’ll be short of calcium, iron, potassium, D3, K2, retinol, B12, sodium if you adopt EAT Lancet diet. It’s nutritionally deficient. Irresponsible! Those who feel that meat eaters are as bad as smokers and should eat their meals outside of the restaurant are obviously not coming from a place of reason and should be removed from decisions involving dietary policy. What concerns me is that people will give this report the same weight as Dietary Guidelines that go through years of discussion, must be based on scientific evidence, analysis and vetting by a team of experts that have to disclose COI – unlike this report. I work as a renal RD, & so I experience daily the actual impact pseudoscience like the #EATLancet study can have on society. It’s nonsense like this that has caused so many of my patients to fear meat—which improves clinical outcomes—more than highly processed foods. Unfortunately, quantity of evidence does not equate to quality – especially in the diet/health arena. The #EATLancet diet: Nearly eliminates foods with important nutrients (dairy and all other products from animal origin). Will lead to an increase consumption of calories. Will have similar impact on climate change. 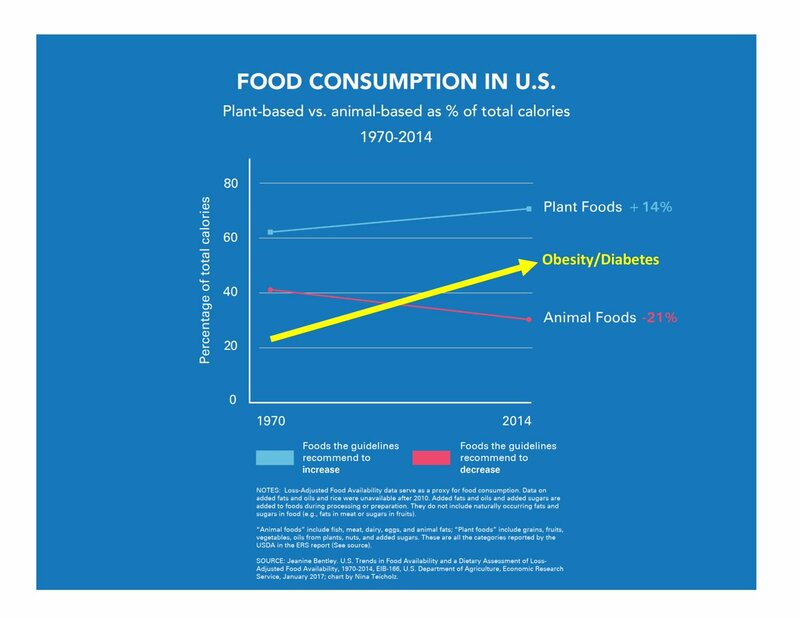 In the late 1970s in America, the idea that a plant-based diet might be the best for health as well as the most historically authentic was just entering the popular consciousness. Active efforts to demonize saturated fat had been underway for more than fifteen years by that time, and we’ve seen how the McGovern committee’s staff were in short order persuaded by these ideas. Even so, the draft report that Mottern wrote for the McGovern committee sparked an uproar—predictably—from the meat, dairy, and egg producers. They sent representatives to McGovern’s office and insisted that he hold additional hearings. Under pressure from these lobbies, McGovern’s staff carved out an exception for lean meats, which Americans could be advised to eat. Thus, Dietary Goals recommended that Americans increase poultry and fish while cutting back on red meat, butterfat, eggs, and whole milk. In the language of macronutrients, this meant advising Americans to reduce total fat, saturated fat, dietary cholesterol, sugar, and salt while increasing carbohydrate consumption to between 55 percent and 60 percent of daily calories. While Mottern would have liked the final report to advise against meat altogether, some of the senators on the committee were not so unequivocally confident about their ability to weigh in on matters of nutritional science. The ranking minority member, Charles H. Percy from Illinois, wrote in the final Dietary Goals report that he and two other senators had “serious reservations” about the “divergence of scientific opinion on whether dietary change can help the heart.” They described the “polarity” of views among well-known scientists such as Jerry Stamler and Pete Ahrens and noted that leaders in government, including no less than the head of the NHLBI as well as the undersecretary of health, Theodore Cooper, had urged restraint before making recommendations to the general public. Yet this hesitation turned out to be too little too late to stop the momentum that Mottern’s report had set in motion. Dietary Goals revived the same argument that Keys and Stamler had used before: that now was the time to take action on an urgent public health problem. “We cannot afford to await the ultimate proof before correcting trends we believe to be detrimental,” said the Senate report. So it was that Dietary Goals , compiled by one interested layperson, Mottern, without any formal review, became arguably the most influential document in the history of diet and disease. Following publication of Dietary Goals by the highest elective body in the land, an entire government and then a nation swiveled into gear behind its dietary advice. “It has stood the test of time, and I feel very proud of it, as does McGovern,” Marshall Matz, general counsel of the McGovern committee, told me thirty years later. Proof of the report’s substantiality, according to Matz, is that its basic recommendations—to reduce saturated fat and overall fat while increasing carbohydrates—have endured down to today. But such logic is circular. What if the US Congress had said exactly the opposite: to eat meat and eggs and nothing else? Perhaps that advice, supported by the power of the federal government, would have lived on equally well. In the decades since the publication of Dietary Goals , Americans have seen the obesity and diabetes epidemics explode—a hint, perhaps, that something is wrong with our diet. Based on these facts, the government might have deemed it appropriate to reconsider these goals, but it has nevertheless stayed the course because governments are governments, the least nimble of institutions, and unable easily to change direction. One hundred and eleven years ago a scientist in St. Petersberg Russia fed rabbits meat, eggs, and dairy. Not unexpectedly for a herbivorous animal, it built up in the blood vessels. It also built up in the ligaments, the tendons, the muscles, and everywhere else in the rabbits body without any evolved mechanism for excretion. This yellow goop in the rabbit’s aortas looked just like human atherosclerosis, which had only been described four years earlier. This started science down a misguided pathway of focusing on fat as the cause of hardening of the arteries. A pathway that future historians will likely call the greatest tragedy in terms of years of life lost in the history of humanity. Initially it was eating cholesterol that was blamed for causing of hardening of the arteries. Then in the 1950s an American physiologist, who had such an affinity for hard compacted refined carbohydrates that he designed soldiers rations featuring it, expanded the blame from cholesterol to all fat, especially animal fat. Carbohydrates should be increased and fat excluded, that was the battle cry! In the 1970s this unproven theory drew the attention of the US senate, and within a few short years blaming fat for atherosclerosis became a worldwide revolution. This time period, interesting, also marks the beginning of the obesity epidemic that has gripped the world’s developed countries. Tragically, what everyone seemed to have missed was the fact that there was no conclusive scientific evidence for this theory, and over time much of that thinking has actually been proven wrong. I have little doubt that issuing these guidelines without conclusive scientific evidence will eventually be viewed as the most significant blunder in the history of science. I am an ICU doctor. I see the carnage that this cavalier and misguided attitude towards food guidelines has caused every single day, up close and personal. The tears of families suffering loss. The premature death of those who should have had long lives. Parents burying their adult sons and daughters. Atherosclerosis, obesity, and type 2 diabetes, when grouped together represent the top conditions for admission to adult ICUs everywhere on earth where our unhealthy Western Diet is consumed. And approximately one in five don’t survive their ICU stay. But what makes me the most angry is the fact that those people who draft these misguided non-scientific food guidelines, with their biased agendas and misrepresented studies, sit in government offices and ivory towers completely remote from the devastating impact of their work. Is it any wonder that the doctors of the world represent a large portion of those leading the charge against our current misguided food guidelines. Doctors are not remote to the problem or blind to the devastation. It is here every single day at work. This has to stop. Food guidelines need to be based on rigorous science. How many more thousands of people have to die. The EAT/Lancet Backers: Definitely in it for the Good of the Planet. Does Lancet want to hand control of our diets to the state? Can cows cause more climate change than cars? To say this is comprehensive would be an understatement. Thanks. I can get obsessive-compulsive when it comes to gathering and organizing info. I can’t help myself. I’d rather have done something else with my time, actually. But it felt important. I revised and expanded it. Now it is even more comprehensive. This was my weekend project. But now back to the work week that pays the bills. This is the best critique I’ve read so far, and all the better because it doesn’t come from a libertarian ideological position as many others have, but from a realisation of how the culture of global waste-for-profit trade drives our problems. Also look at another EAT sponsor, HRH Prince Alwaleed. He claims to be vegan, his family fortune comes from oil. Like most of these people, his motivation seems to be simple whataboutery, to avoid dealing with the realisation that he has been a bigger part of the problem than he can ever be part of the solution. It wasn’t as hard to do as it might’ve been. Following a bunch of social media accounts helped. So many others were responding to EAT-Lancet with commentary, analyses, and info. I just had to gather it together. Then put my own spin on it. I’d seen some of the libertarian critiques. They were imbalanced in predictable ways. But in writing my own piece, I drew upon all perspectives available, including the libertarian. I have a slight left-libertarian slant to my own mind, though it’s not that I’m against all government on principle. My general tendency is toward liberalism. Not that it stops me from complaining about the liberal class. What goes for ‘liberal’ in the mainstream is endlessly irritating. There are more people who use liberal rhetoric than are sincerely concerned about liberal values. I’ve been vegetarian for a time. It didn’t work for me. Still, I have nothing against vegetarians or vegans. I’ve always known many people, including my brothers and their families, who adhere to these diets. But I can’t stand hypocrisy. Calling oneself a ‘vegan’ or whatever doesn’t give one a free pass of moral superiority and righteousness. There is a world of difference between putting a tax on soda or cigarettes to reduce consumption, and putting a tax on any nutritious food for the same reason. You could argue about the likely effects of the first, sure, but there is no reason to see them all as the constituent parts of an identical mistake unless you’re opposed to tax or central government or some similar non-dietary belief. I’ve nothing against governments trying to regulate the economy to avoid future shocks as long as they do it in an unbiased, scientific way, if that’s possible. But if you did that, epidemiology would hardly deserve a look-in, especially FFQ epidemiology, and especially in populations that have been reflecting the observers’ well-publicised biases back at them ever since the days of Ancel Keys. I mean, everyone knows what are the “right” and “wrong” answers in the FFQ, so one of the confounders it measures is whether one cares about healthy-eating advice. (another will be IQ, because it’s hard to make it truly representative even of one’s recollections). This messiness makes Willett the modern version of those guys who inspected the entrails of birds for Roman emperors. Their art was all in the interpretation of the data in a way that both pleased their master at the time and ensured their tenure if things went wrong. I’m fine with sin taxes. As long as the revenue goes directly back to funding programs for the ‘sin’ in question. For example, a sin tax on cigarettes should pay for healthcare and research on lung cancer, etc. But a sin tax should never be used by politicians as a way to get more money for their pet projects and to give to their cronies. The crux of the matter is as you say. Epidemiology is weak stuff. It’s great for looking for patterns and possible insights, for narrowing down interpretations and formulating hypotheses. But such research is not and can never be conclusive. It is pure insanity or cynical corruption to use correlative data to rationalize government policy. Though some epidemiological research is better than others, depending on how many confounders are controlled for. FFQ, in particular, is problematic. That isn’t to throw out such data. But it should be looked at with extreme caution and any interpretation should be held tentatively. It’s acceptable for preliminary research, but easily misleading. It means nothing by itself. It is odd how certain diets attract certain types. Carnivore/keto aligns more with attitudes of autonomy and self-determination, whereas paleo is mixed up with the seeking of scientific respectability and social relevance (as seen with the fights involving the likes of Tim Noakes, a top-ranked researcher). I notice that many libertarians, right-wingers and reactionaries (consider Jordan Peterson) are on diets such as carnivore and keto, and tending toward scientific nutritionism and health hacking. It has a strong element of self-improvement and self-empowerment, and hence proving one’s superiority or manliness, often with an element of Social Darwinism. The same kind of people often are into alternative economics (e.g., bitcoins), entrepreneurial fantasies, and capitalist realism; maybe found in greatest concentration among the pseudo-libertarian tech bros. There is a weird vibe mixed in, as it is more than a diet or even a lifestyle because there tends to be a class-based political ideology. The paleo crowd seems more liberal on average. There is some commonality in worldview with traditional foods, but without some of the more alternative leftist views, from homeopathy to anti-vax. Paleo seems much more mainstream, more acceptable to many medical doctors, researchers, and former vegans/vegetarians. Dr. Terry Wahls fits this description perfectly, a liberal class professional of the mostly apolitical and non-offensive variety. There is much more diversity within the paleo community, maybe because of the growing size as it gains popularity, with some emphasis on advocacy of healthcare reform. As with traditional foods, more women are drawn to paleo (look at the contributors to Paleo Magazine, sometimes being majority women) and so there is a different feel to the paleo community with more discussion of women’s issues and family cooking. There is a more communal than individual vibe (there is sometimes the advice to get the whole family involved in dietary changes). Where paleo and traditional foods crosses over the most is in a certain sector of functional medical practitioners, typically women. This area focuses on new agey worldview with meditation, positive thinking, self-care, and a generally optimistic attitude about society. Those involved enjoy group activities for learning and support. They’e not so much the hard-nosed scientific types, although some functional medical practitioners are also medical doctors (Terry Wahls, Dale Bredesen, etc). I’m most familiar with this worldview as it is what I grew up in through my childhood church, Unity. Interestingly, in following some of these people on social media, I haven’t noticed any of them talk of EAT-Lancet. For whatever reason, those involved in functional medicine, of the new agey type or otherwise, tend toward the apolitical. They’re just not the type of person who wants to fight hard issues. They’d rather focus on what is positive and what is personal, the realm of experience where they can influence their own lives. Since writing this, I notice there is one thing that bothers me more than all else. I might be willing, however grudgingly, to give the benefit of the doubt to some of the individual actors on the committee. They likely do have good intentions. But that isn’t good enough. That is no way to run a society. What we need are good results and I feel no moral obligation nor inclination of any sort to trust the plutocratic and paternalistic ruling elite because they tell me they have my best interests at heart. This report comes off as having been written by a committee, which it was. There are so many aspects of it and agendas in it that there is no coherent vision and one is left wondering whose purposes are ultimately being served. It’s a mish-mash of rhetoric that could be used to almost any end. The lack of transparency is most concerning. Consider the corporate backers. The EAT-Lancet report never admits to their existence. You have to go to the separate EAT Foundation. Then you have to find one particular project called FReSH that has a page hidden at the back of the website. If there is no ulterior motive, why hide this? And what else is hidden, yet to be discovered? On top of that, the individual authors are scientists who work for various institutions and many of them get corporate funding elsewhere, such as for doing their research, and in most cases it would be the exact same transnationals funding the various organizations, projects, and interests behind EAT-Lancet. Walter Willett, a lead researcher of the report, works for Harvard which is one of the most heavily corporate-funded colleges around, specifically the nutritional research done there. It’s a web of hidden influences and agendas. So are we supposed to trust their good intentions? And are we supposed to overlook the fact that the EAT-Lancet diet consists almost entirely of ingredients (grains, legumes, soy, & vegetable oils) that are the cheapest and most profitable for big ag to produce and big food to use in their products? Am I crazy for considering trasparency and democracy to not be optional but as necessary requirements of good governance and a free society? With shady organizations like the EAT Foundation, how do we expect to solve complex and systemic problems that implicate the very people and organizations involved? We are supposed to assume that the system will reform itself from within, really? Rosemary Stanton is a nutritionist and dietician. Besides being a celebrity figure in the food world, she has worked on a national committee for the Australian government that developed their official dietary guidelines. She is also on a scientific advisory committee (DEA – Doctors for the Environment Australia). She is a very important person. Still, I’m not exactly sure her connection to the EAT-Lancet committee and report or the organizations behind it, but she seems to be connected in some way. She has been using her authority to push the EAT-Lancet report and diet in articles and has been a staunch defender of it in social media. I see her writings and comments all over the place and so it must be her full-time job for the moment, whatever purpose she is supposed to be serving in this capacity. Anyway, she is or claims to be familiar with the inner workings of the EAT-Lancet committee. She recently admitted in a tweet that, “The report was peer reviewed by the Commission.” This telling admission was brought to my attention by Nina Teicholz. So, apparently, the EAT-Lancet report was ‘peer-reviewed’ by its own authors, at least according to Stanton who didn’t see anything wrong with that. The Lancet journal commissioned the report, gathered a bunch of experts who already agreed with each other beforehand, and had them write a report and peer review it. Then the Lancet journal published it. It has been decreed from on high! It’s a new form of scientific methodology. It streamlines the whole process. Let’s call it fiat science.